If you are new to my blog, just complete the questions below. If you have your 2016 list add this question: How would you view your biggest triumph, greatest lesson and most important relationship from your 2016 list, 12 months later? Now look at your biggest piece of unfinished business from 2016. Where does that stand now? Do you care? Power Up by asking yourself one additional question: How can technology – current or envisioned – help you grown your business? What is the one technology advancement that would build your revenues, attract more customers, and/or save you time and money? I am sitting with that question for myself. The science of human achievement and flourishing is now so solid that the next frontier is mass integration in a way that really matters. I am of the opinion that in my field of the psychology of achievement and success, technology has mastered the ‘mass dissemination’ part of the puzzle, AND is failing miserably at the mass integration of all the excellent information that is available. Have fun completing and remembering. The short video I have included with this bolg is one of my many happy rememberings from 2017. What was your biggest triumph of 2017? What one word best sums up and describes your 2017 experience? What was the most loving service you performed in 2017? Who were the three people that had the greatest impact on your life in 2017? What was the biggest risk you took in 2017? What was the biggest surprise in 2017? What important relationship improved in the most in 2017? What compliment would you liked to have received in 2017? What compliment would you liked to have given 2017? What else do you need to do or say to be complete as you begin 2018? A book that matters: Power Up by Magdalena Yeşil with Sara Grace. 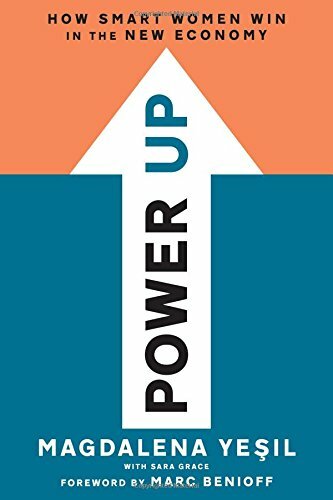 Power Up is a book intended for woman in business, yet time and time again I felt it would be the perfect book for a co-ed learning experience in the workplace. I sensed in many chapters that the book would help younger professional women understand their older female colleagues — and benefit more quickly from their wisdom. There are some mistakes that are just not worth making twice. My biggest learnings came from the chapters that should be read by everyone – males almost more so than females (Chapters 3 and 9). Chapter 3 taught me two things, a new word and gave me a resource for my male clients to read on understanding sexual harassment. The word was gravitas – the virtue which combines seriousness with dignity. I had seen the word before but the authors personalization of it made it come to life. I found the word to be a gender-neutral guide to professionalism. Chapter 3 also amazed with the description of sexual harassment – not as much the details – but the timing and applicability to December 2017. Remember that a hardcover book usually takes over 12 months to write and get published. That means Chapter 3 was written before the most recent sexual harassment events of late 2017. That context alone makes the chapter’s story — focus on results and outcome — important. I am purposely not going into detail so you will buy the book. Just imagine using that chapter to facilitate a discussion in your workplace. Then there is Chapter 9 which I group with the Epilogue (which I read before the rest of the book) and The Executives of Power Up (one of whom gifted the book to me). These pages draw a beautiful picture how things have evolved over 30+ years and how to grow the next 30 years of business in a way that everyone feels powered up. I found Power Up to be a book that helped me complete and remember 2017 in a different way. In fact, the question I added about technology and your business came as I was reading. Whenever I expand my thinking when reading a book, it is a book that matters. Happy Holidays. Happy Reading. The Happiest of Completing and Remembering.